This is the second installment of Planning a Destination Wedding. The great thing about destination weddings is that you and your guests have the opportunity to be a part of something truly special unlike anything you could ever put together at home. Its not just another wedding. Its an experience that you, your fiancé, and your guests will cherish for a lifetime. In the early stages of planning, there are both fun and not so fun things that you need to accomplish. At this point you should have already chosen a location and done a fair amount of research. So what's next you ask? 1. Get a move on! Now you need to start taking steps toward getting the legal requirements in order. It doesn't matter if you have two years yet before your wedding. Its a bureaucratic process, therefore there will be snags, delays, and mishaps. Start as early as you can. Look at it this way, once all of that is out of the way, you can focus on the fun stuff! Take some time to look in to what the local culture has to offer. Incorporating local traditions, flowers, food, music, and so on is a great way to make your experience truly unique. Are you getting married in Jamaica? Why not walk down the aisle to steel drums (á la Phoebe's wedding in Friends)? Getting married in Italy? Serve local wine at dinner. There is all sorts of unique opportunities. 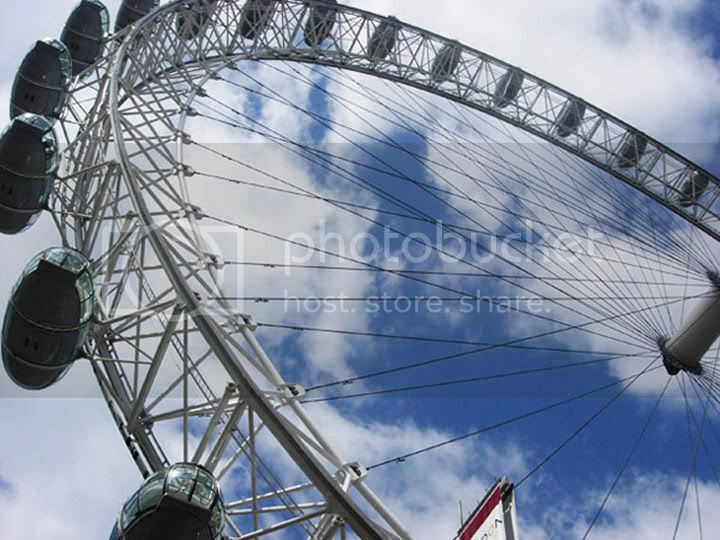 Did you know that you could get married at the top of the London Eye? Seriously, how friggin' cool would that be? To give you an example, at our Scottish wedding, after we got married in the oldest building in the city, St. Margaret's Chapel, we went on a pub crawl for our reception, and even danced to Scottish bagpipes at a The Scotsman Lounge! Yup, that's me dancing with the locals at this quintessential Scottish pub! This is one of my biggest recommendations. I never thought of myself as a wedding planner type of girl: I'm very crafty, creative and most of all, a total control freak. Relinquishing control over my wedding to a stranger? No thank you. But with a destination wedding, its a whole different ball game. You are going to need someone in the location who is working for you and your wedding's interests. And you can hire wedding planners for specific tasks, instead of the full package. This is what Brandon and I did. We hired on Heather Mullohand of Happy Ever After to help with finding, and making contact with some vendors, and help with the legal paper work. Also, keep in mind that if you choose to go the all inclusive resort path, a lot of times, a wedding planner is part of that package, or offered as an add-on. Not only can local wedding planners be able to make suggestions to possibilities you didn't even know existed, the peace of mind that comes with knowing there is someone in the country/destination who is on your side is entirely worth it. This is a good time to consider where you want to honeymoon and how that relates to the destination you have chosen. If you are getting married in a warm, tropical place, a lot of couples will choose to honeymoon right there! A lot of resorts will cut you a deal if you have wedding and honeymoon at the same place. Score! Something to keep in mind, however, if you choose this route. Most likely, the guests coming with you to celebrate your wedding aren't going to just stay for the wedding and head home. They flew all that way, they are probably going to make a vacation of it, too. And will probably be staying at the same resort. Now I know you love your family, and some people might enjoy that, but if you want a little alone time together, I would recommend traveling to another location for your honeymoon. It doesn't have to be far, it can be another island, or the other side of the one you're on. And if you have travel fanatic family members (like we do), its best to keep your honeymoon plans secret (like we did). The family would say things like, "you can't go to ______ and not take us!!" Yeah, I love 'em, but I wanted some time to decompress with my new husband. If you are flying to Europe, think of it this way: you are already in Europe, so you might as well take advantage of it and see a few different things. Brandon and I could have honeymooned in Scotland (there is plenty to do!) but we were more then halfway to Greece, a location we have longed to visit for some time, so we figured might as well keep heading east! And we were craving some sunshine and warm weather, which we partially got. This is one of the most exciting and fun parts of planning a destination wedding; the possibilities are endless! Make sure to enjoy it and explore to your little heart's desire! In the next installment of Planning a Destination Wedding, its all about making it happen!